One of the nation’s top test preparation services, The Princeton Review, announced today the release of a new app for Apple’s iPad tablet that students can use to help prepare them for the oh-so-important SAT. Dubbed SAT Score Quest, the app “allows students to select their SAT score goals and take a short assessment designed to diagnose their relative strengths in the Critical Reading, Math and Writing sections of the SAT,” says a press release about the app. To further guide the studying, the app prepares a “personalized score report,” which shows students where they need the most work. Additional SAT preparation features in the app include ShowMe lessons, which guide students through lessons using The Princeton Review’s “unique methodology for teaching students to arrive at the right answer as efficiently as possible.” Students can also review how they work through individual problems by recording as they make virtual notes and cross-out answers they think are incorrect. These recordings can then be played back, so that students can see where they went right (or wrong) in a particular problem. 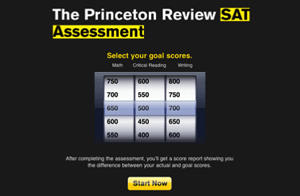 Of course, the app is also used to promote The Princeton Review’s in-person SAT preparation services. If students aren’t pleased with their test score results, the app allows users to enter in their phone number directly, so that a Princeton Review adviser can call them for a “free consultation.” The Princeton Review — which is not associated in any way with Princeton University — currently operates test preparation classes in 41 US states, and provides these services for a wide variety of exams to students in 22 countries around the world. The SAT Score Quest app is only the most recent addition to a growing market of education-centric apps for tablet PCs like Apple’s iPad and iPad 2, as well as e-readers. In addition to a wide range of educational apps already available, a recent study by Xplana predicts that one in four college textbooks will be digital by 2015. This may be helped along by e-book company Inkling, which recently signed a deal with two of the world’s top textbook makers, Pearson and McGraw-Hill, to increase its repertoire of digital textbooks to around 100 by the fall of this year.